Montreal, September 9, 2014 – Whether you're a believer or not, it is always with a profound attitude of reverence that one would indulge in the music of the German masters from the Baroque period. 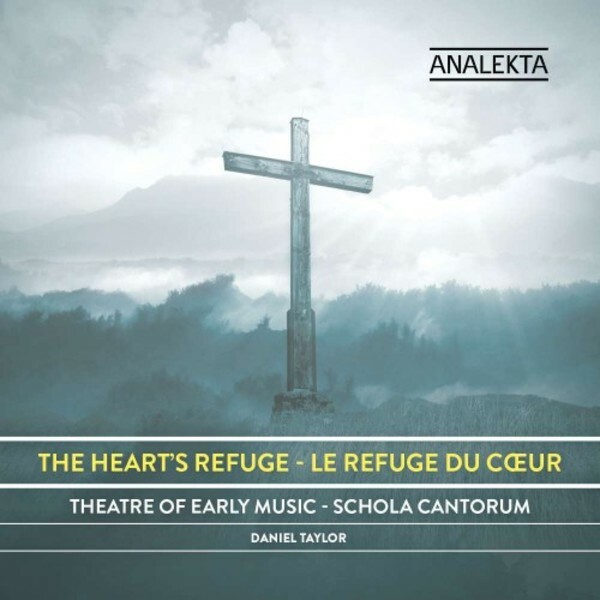 With this new album on the Analekta label, entitled 'Heart's refuge', ensembles Theatre of Early Music and Schola Cantorum, under the direction of Maestro (and one of the most sought-after counter-tenors in the world) Daniel Taylor, take us even deeper into the heart and soul of contemporaries during one of the most tormented period in history, the Thirty Years War (17th century). True to its mission, to become a fixture in the rediscovery of early music, the TEM, along with its founder and artistic director, Daniel Taylor, bring to light the splendid cantatas of five German composers of the Baroque period, on one album: Dietrich Buxtehude (1637–1707), Johann Christoph Bach (1642–1703), Johann Heinrich Schmelzer (1623–80), Johann Kuhnau (1660–1722) and Nicolaus Bruhns (1665–97). Sung in German for the most part, these cantatas were rearranged based on the forms previously established and constantly reinvented by the great Italian masters of Baroque music, a few testimonies of the misery and the turmoil, but also of the solace found in a century torn by suppression and internal conflicts. The TEM musicians and their conductor are offering here a 400 year jump back in time. Between 1618 and 1648, a series of devastating conflicts decimated half the population on the European continent. While believers found refuge in their faith and in the hope of a better world, composers of the era were found an inexhaustible source of inspiration. During the 17th century, Lutheran musicians established a magnificent repertoire of sacred music. The texts highlight the message of Christ in an original and varied way. Death and salvation... the suffering of Jesus... the distress of the soul... are all illustrated by inventive methods of musical imagery: a pattern unrelentingly repeated to hammer home the message in the believer's mind; simple melodies with sophisticated harmonies to create a profound sense of peace; rapid changes in contrasts; voices that alternately go from soprano to bass to reminisce of the burial of Christ... All of which reflect very well the emotional burden carried by these creators affected by the throes of war and destruction. A non-profit organization since 2002, the TEM is dedicated to promoting early music in all its glory, by reviving its musical practices and the sound of its instruments. The ensemble's extraordinary musicians share and communicate their passion for early music thanks in part to famous guest artists (Nancy Argenta, Robin Blaze, James Bowman, Benjamin Butterfield, Michael Chance, Charles Daniels, Alexander Dobson, Karina Gauvin, James Gilchrist, Michael George, Peter Harvey, Dame Emma Kirkby, Suzie LeBlanc, Daniel Lichti, Carolyn Sampson, Michiel Schrey, Stephen Varcoe and Deborah York) and to national and international tours (France, Argentina, Brazil, England and China). Under the baton of their conductor, the excellent choir singers of the Schola Cantorum of the University of Toronto, students of all academic levels, also driven by the urge of raising the visibility on early music in its original form, join the TEM and offer a superb and genuine performance. Daniel Taylor and the TEM musicians do a thorough job of bringing back the human and historical dimensions to these works, just as one would by restoring the splendour of a great artist's work. To listen to this album is to rediscover an old world in a new light.